There are dozens of bearish reversal patterns. 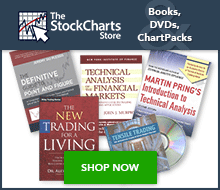 We have elected to narrow the field by selecting a few of the most popular patterns for detailed explanations. For a complete list of bearish and bullish reversal patterns, see Greg Morris' book, Candlestick Charting Explained. Below are some of the key bearish reversal patterns, with the number of candlesticks required in parentheses. Most patterns require further bearish confirmation. Bearish reversal patterns should form within an uptrend. Bearish reversal patterns can form with one or more candlesticks; most require bearish confirmation. The actual reversal indicates that selling pressure overwhelmed buying pressure for one or more days, but it remains unclear whether or not sustained selling or lack of buyers will continue to push prices lower. Without confirmation, many of these patterns would be considered neutral and merely indicate a potential resistance level at best. Bearish confirmation means further downside follow through, such as a gap down, long black candlestick or high volume decline. Because candlestick patterns are short-term and usually effective for 1-2 weeks, bearish confirmation should come within 1-3 days. Time Warner (TWX) advanced from the upper fifties to the low seventies in less than two months. The long white candlestick that took the stock above 70 in late March was followed by a long-legged doji in the harami position. A second long-legged doji immediately followed and indicated that the uptrend was beginning to tire. The dark cloud cover (red oval) increased these suspicions and bearish confirmation was provided by the long black candlestick (red arrow). To be considered a bearish reversal, there should be an existing uptrend to reverse. It does not have to be a major uptrend, but should be up for the short term or at least over the last few days. A dark cloud cover after a sharp decline or near new lows is unlikely to be a valid bearish reversal pattern. Bearish reversal patterns within a downtrend would simply confirm existing selling pressure and could be considered continuation patterns. The security is trading above its 20-day exponential moving average (EMA). Each reaction peak and trough is higher than the previous. The security is trading above a trend line. These are just three possible methods. Some traders may prefer shorter uptrends and qualify securities that are trading above their 10-day EMA. Defining criteria will depend on your trading style, time horizon, and personal preferences. Candlesticks provide an excellent means to identify short-term reversals, but should not be used alone. Other aspects of technical analysis can and should be incorporated to increase the robustness of bearish reversal patterns. In Jan-00, Nike (NKE) gapped up over 5 points and closed above 50. A candlestick with a long upper shadow formed and the stock subsequently traded down to 45. This established a resistance level around 53. After an advance back to resistance at 53, the stock formed a bearish engulfing pattern (red oval). Bearish confirmation came when the stock declined the next day, gapped down below 50 and broke its short-term trend line two days later. Use oscillators to confirm weakening momentum with bearish reversals. Negative divergences in MACD, PPO, Stochastics, RSI, StochRSI or Williams %R indicate weakening momentum and can increase the robustness of a bearish reversal pattern. In addition, bearish moving average crossovers in the PPO and MACD can provide confirmation, as well as trigger line crossovers for the Slow Stochastic Oscillator. Use volume-based indicators to assess selling pressure and confirm reversals. On Balance Volume (OBV), Chaikin Money Flow and the Accumulation/Distribution Line can be used to spot negative divergences or simply excessive selling pressure. Signs of increased selling pressure can improve the robustness of a bearish reversal pattern. For those that want to take it one step further, all three aspects could be combined for the ultimate signal. Look for a bearish candlestick reversal in securities trading near resistance with weakening momentum and signs of increased selling pressure. Such signals would be relatively rare, but could offer above-average profit potential. A number of signals came together for RadioShack (RSH) in early Oct-00. The stock traded up to resistance at 70 for the third time in two months and formed a dark cloud cover pattern (red oval). In addition, the long black candlestick had a long upper shadow to indicate an intraday reversal. Bearish confirmation came the next day with a sharp decline. The negative divergence in the PPO and extremely weak money flows also provided further bearish confirmation. The bearish engulfing pattern consists of two candlesticks: the first is white and the second black. The size of the white candlestick is relatively unimportant, but it should not be a doji, which would be relatively easy to engulf. The second should be a long black candlestick. The bigger it is, the more bearish the reversal. The black body must totally engulf the body of the first white candlestick. Ideally, the black body should engulf the shadows as well, but this is not a requirement. Shadows are permitted, but they are usually small or nonexistent on both candlesticks. After an advance, the second black candlestick begins to form when residual buying pressure causes the security to open above the previous close. However, sellers step in after this opening gap up and begin to drive prices down. By the end of the session, selling becomes so intense that prices move below the previous open. The resulting candlestick engulfs the previous day's body and creates a potential short-term reversal. Further weakness is required for bearish confirmation of this reversal pattern. After meeting resistance around 30 in mid-January, Ford (F) formed a bearish engulfing (red oval). The pattern was immediately confirmed with a decline and subsequent support break. Note: The Bearish Engulfing candlestick pattern is similar to the outside reversal chart pattern, but does not require the entire range (high and low) to be engulfed, just the open and close. The dark cloud cover pattern is made up of two candlesticks; the first is white and the second black. Both candlesticks should have fairly large bodies and the shadows are usually small or nonexistent, though not necessarily. The black candlestick must open above the previous close and close below the midpoint of the white candlestick's body. A close above the midpoint might qualify as a reversal, but would not be considered as bearish. Just as with the bearish engulfing pattern, residual buying pressure forces prices higher on the open, creating an opening gap above the white candlestick's body. However, sellers step in after the strong open and push prices lower. The intensity of the selling drives prices below the midpoint of the white candlestick's body. Further weakness is required for bearish confirmation of this reversal pattern. After a sharp advance from 37 1/2 to 40.5 in about 2 weeks, Citigroup (C) formed a dark cloud cover pattern (red oval). This pattern was confirmed with two long black candlesticks and marked an abrupt reversal around 40.5. The shooting star is made up of one candlestick (white or black) with a small body, long upper shadow, and small or nonexistent lower shadow. The size of the upper shadow should be at least twice the length of the body and the high/low range should be relatively large. Large is a relative term and the high/low range should be large relative to the range over the last 10-20 days. The bearish harami is made up of two candlesticks. The first has a large body and the second a small body that is totally encompassed by the first. There are four possible combinations: white/white, white/black, black/white and black/black. Whether a bullish reversal or bearish reversal pattern, all harami look the same. Their bullish or bearish nature depends on the preceding trend. Harami are considered potential bearish reversals after an advance and potential bullish reversals after a decline. No matter what the color of the first candlestick, the smaller the body of the second candlestick is, the more likely the reversal. If the small candlestick is a doji, the chances of a reversal increase. In his book, Beyond Candlesticks, Steve Nison asserts that any combination of colors can form a harami, but the most bearish are those that form with a black/white or black/black combination. Because the first candlestick has a large body, it implies that the bearish reversal pattern would be stronger if this body were black. This would indicate a sudden and sustained increase in selling pressure. The small candlestick afterwards indicates consolidation before continuation. After an advance, black/white or black/black bearish harami are not as common as white/black or white/white variations. A white/black or white/white combination can still be regarded as a bearish harami and signal a potential reversal. The first long white candlestick forms in the direction of the trend. It signals that significant buying pressure remains, but could also indicate excessive bullishness. Immediately following, the small candlestick forms with a gap down on the open, indicating a sudden shift towards the sellers and a potential reversal. After a gap up and rapid advance to 30, Ameritrade (AMTD) formed a bearish harami (red oval). This harami consists of a long black candlestick and a small black candlestick. The decline two days later confirmed the bearish harami and the stock fell to the low twenties. Merck (MRK) formed a bearish harami with a long white candlestick and long black candlestick (red oval). The long white candlestick confirmed the direction of the current trend. However, the stock gapped down the next day and traded in a narrow range. The decline three days later confirmed the pattern as bearish. A small white or black candlestick that gaps above the close (body) of the previous candlestick. This candlestick can also be a doji, in which case the pattern would be an evening doji star. The long white candlestick confirms that buying pressure remains strong and the trend is up. When the second candlestick gaps up, it provides further evidence of residual buying pressure. However, the advance ceases or slows significantly after the gap and a small candlestick forms, indicating indecision and a possible reversal of trend. If the small candlestick is a doji, the chances of a reversal increase. The third long black candlestick provides bearish confirmation of the reversal. After advancing from 68 to 91 in about two weeks, AT&T (T) formed an evening star (red oval). The middle candlestick is a spinning top, which indicates indecision and possible reversal. The gap above 91 was reversed immediately with a long black candlestick. Even though the stock stabilized in the next few days, it never exceeded the top of the long black candlestick and subsequently fell below 75. A doji that gaps above the high of the previous candlestick. A long black candlestick that gaps below the low of the doji. The main difference between the evening doji star and the bearish abandoned baby are the gaps on either side of the doji. The first gap up signals a continuation of the uptrend and confirms strong buying pressure. However, buying pressure subsides after the gap up and the security closes at or near the open, creating a doji. Following the doji, the gap down and long black candlestick indicate strong and sustained selling pressure to complete the reversal. Further bearish confirmation is not required. Delta (DAL) formed an abandoned baby to mark a sharp reversal that carried the stock from 57 1/2 to 47 1/2. Although the open and close are not exactly equal, the small white candlestick in the middle captures the essence of a doji. Indecision is reflected with the small body and equal upper and lower shadows. In addition, the middle candlestick is separated by gaps on either side, which add emphasis to the reversal. Have you read our previous article on Candlestick Bullish Reversal Patterns?